First off, Holland & Barrett have a ‘Buy one, Get One Half Price’ offer on everything including their large vegan Easter Range. All available online too. This is a recipe from the book ‘French Women Don’t Get Fat’ that we veganised. Mix the dry. Add the wet. Stir thoroughly and divide between 12 cake cases. Bake at 200C/400F for up to 20 minutes or until risen and firm. Once they have cooled: ice them! Melt it all up in pan over a very low heat. Once well mixed, allow to cool and thicken a little before spreading on the cakes. 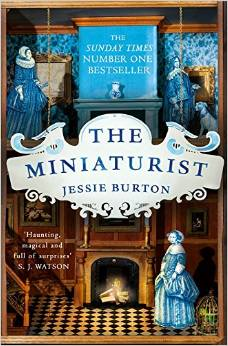 Set in 17th century Amsterdam, Jessie Burton’s novel follows the lives of newly married Nella Oortman and her family. Intrigue surrounds the dolls house that Nella is given as a wedding gift and the mysterious miniaturist whose wares echo the lives of the people in the real house. Gripping and unputdownable. Top the jug off with juice of your choice: apple for a sweeter smoothie, orange for tartness. Fry the onion in the oil until softened. Add the rice and chickpeas and stir until everything is well heated through. Season. Serve with salad. Simple and utterly delicious. You can really taste the coconut. The beautiful new cookbook from Viva! by Jane Easton (see her delicious beanburger recipe over on frugal). The organisational structure of the book is exceptionally user-friendly. First there’s the main sections: Vegan Basics; Souperb; A bit on the side; Back to the sauce; The main event and Sweet thing. Then there’s a range of indexes based on the codes found on the recipe pages: budget dishes, fast feeds, Gluten & wheat free, cooking for one, kid-friendly, freezable, low fat/diabetic-friendly. The recipes themselves are diverse and gorgeous and there’s a stunning colour photo beside each one. 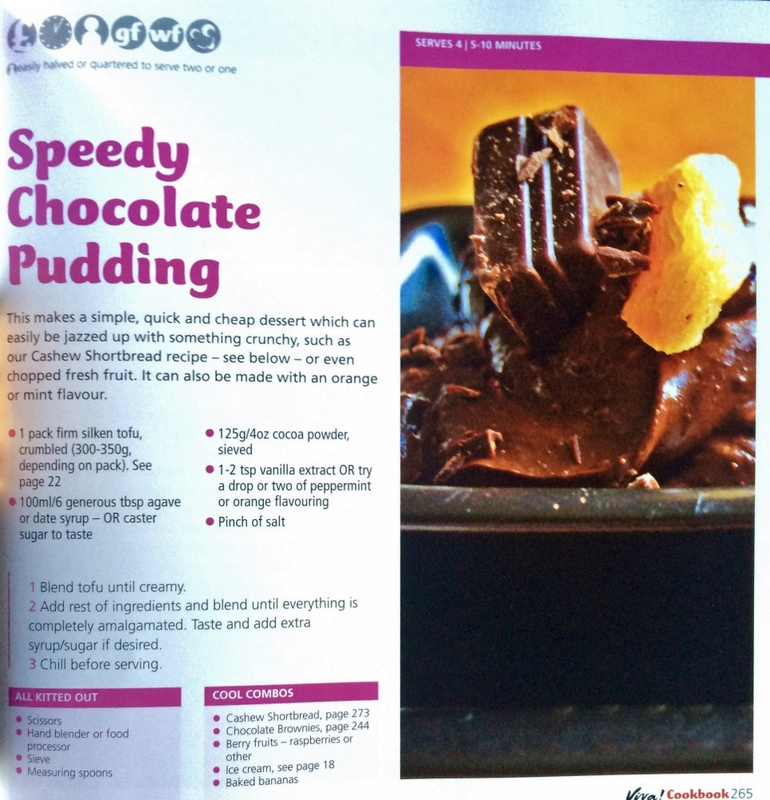 It’s hard to know where to start with describing them as there as so many, so we’ll give you a favourite: Speedy Chocolate Pudding. You can click the photo to see a bigger version. The book is a wonderful mix of simple advice for beginner cooks and those new to veganism through to advanced ideas such as Christmas Stuffed Squash with Two-rice, Cranberry and Porcini Mushroom Filling. Rose Elliot’s Chestnut and Red Wine Pate en croute that we’ve loved for years is also included. There’s Scrambled Tofu; Socca Pizza with Cream Cheese, Sundried Tomatoes and Artichoke Hearts; Perfect Pancakes; Vegetable Tempura; Smokey Black Bean Cakes & Sausages; cakes, muffins, slices… we could go on and on. Really we could, there’s 145 recipes! To buy or read more visit Viva!